Cullen Skink is a full flavoured, hearty, and comfortingly traditional creamy Scottish soup made with smoked fish, potatoes, onions and milk. It's Chowder with a distinctly Scottish accent. When I'm asked to describe my style of cooking I always struggle as it's a bit of a mish mash of styles combined with a passion for seasonality, cooking from scratch and family friendly recipes. However if there is a particular area of speciality it's probably 'Quirky Scottish' or 'Scottish with a Twist'. Today's recipe definitely falls into the Scottish category but it's my take traditional rather than one of my more outlandish creations (i.e. no Irn Bru or Tunnock's Teacakes involved!) For the uninitiated, Cullen Skink possibly doesn't sound the most enticing of foods but I can assure you that it is. 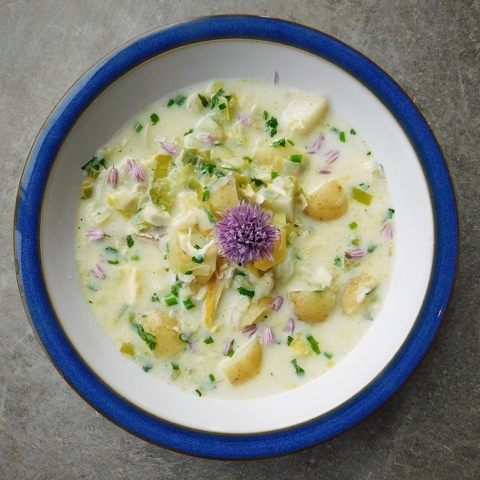 Hailing from Cullen, a small fishing village on the North East coast of Scotland, it's a hearty soup made of milk, smoked fish, potatoes and onion. Think Chowder with a Scottish accent. Touch wood we don't have any issues with food allergies or intolerences within my immediate family (although my daughter appears to be allergic to vegetables...) however I'm all too aware that many people face such challenges on a daily basis so to make my Cullen Skink I used a2 Milk™ which comes from specially selected cows and is naturally easier to digest. As a farmer's daughter this immediately piqued my interest! Research has found that different cows produce milk with different proteins (A1 and A2) and that each of these proteins are digested differently. It's the A1 protein that many people struggle to digest. The folks at a2 Milk™ work with farmers to hand select cows that naturally produce only A2 protein. Nothing added, nothing taken away, just easy to digest cows’ milk. You can find out lots more about a2 Milk™ and see if it might be suitable for you or someone you know who experiences intolerance issues with regular milk at a2milk.co.uk Both my kids drink a LOT of milk and they confirmed that a2 Milk™ tastes exactly the same as regular milk so no worries in that respect. So with a2 Milk™ in hand it's back to my recipe for the tastiest of soups with the least promising of names. Much like Scotch Broth everyone and their granny has a different idea what should and shouldn't be in it and you can of course juggle with adding, removing and adjusting ingredients to suit. Garlic, Bay Leaves and Cream could be a good place to start. However you make it, it's really a meal in itself especially if accompanied by bread or oatcakes. I've jumped onto the on trend edible flowers bandwagon with a garnish of chive flowers. Their purple hues contrast amazingly well with the yellow fish but they are far from essential and definitely not traditional. Perhaps they can be my quirky twist and an edible nod to the Scottish thistle. Gently heat the milk in a shallow saute pan. Add the Smoked Haddock and poach for 10 minutes until lightly cooked. Set aside to cool. In a large soup pan melt/heat the butter/oil, add the onion and leeks and cook gently for 5 minutes until softened but not coloured. Add the potato and the vegetable stock, bring to the boil, cover and simmer for 15 minutes until the potato is soft. 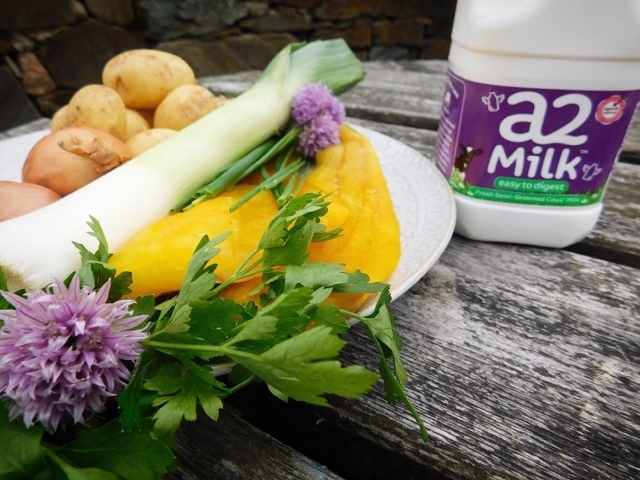 Add the milk from the poached haddock to the soup but not the fish. Gently mash the soup to crush some of the potatoes. Skin and flake the smoked haddock with a fork. Add flaked fish, a generous amount of chopped parsley and season to taste with salt and pepper. Heat through and serve garnished with chopped chives and chive flowers. Disclosure: This is a commissioned post for a2 Milk™. As always, all views expressed are my own. I love chowder but I'm on my own, my family just won't go there! 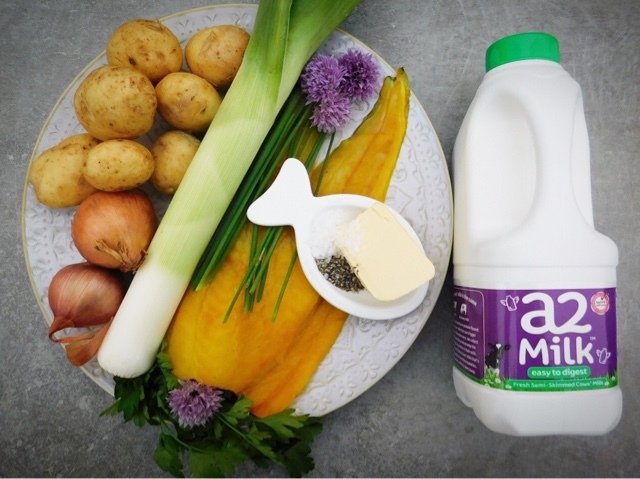 I've not tried Cullen Skink yet so will have to make a small batch just for me :) Also that milk is genius, what a great idea. I've never tried this soup but I absolutely love smoked fish. It looks so hearty and delicious! Looks delicious! Will definitely be making this in the upcoming colder months. This looks like the perfect comfort dish. I love the smoked fish addition. I love chowder and how you used a2 milk in it. This will help eliminating the discomforts that I have from consuming ordinary milk. Such an excellent idea! This looks so delicious, especially with the chive flower garnish! I try to avoid cow's milk as it disagrees with me, so I'll have to give this a2 milk a try and see if it's any better. Thanks! That looks like such a comforting soup and really hearty too. We use a2 milk here too and it has really helped with digestive issues. That's utterly gorgeous! 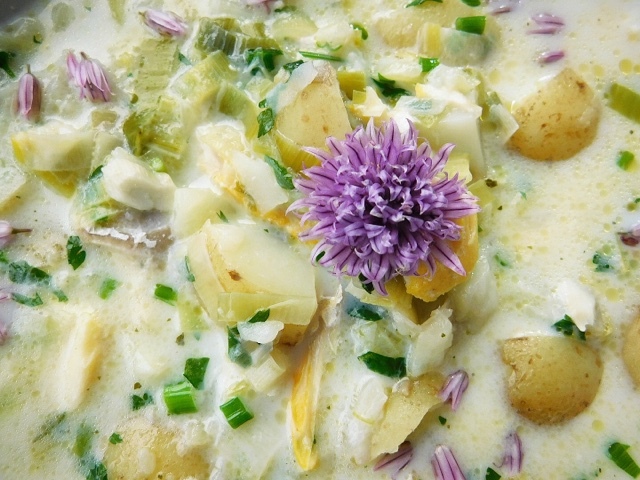 Usually cullen skink, while delicious, isn't much to look at but I love how you have lifted it with the chive flowers. Beautiful! h how I wish it were still cold so I could try this! But I do wonder how it would change the flavor if you used a traditional roux base like most chowders do... Hmm. 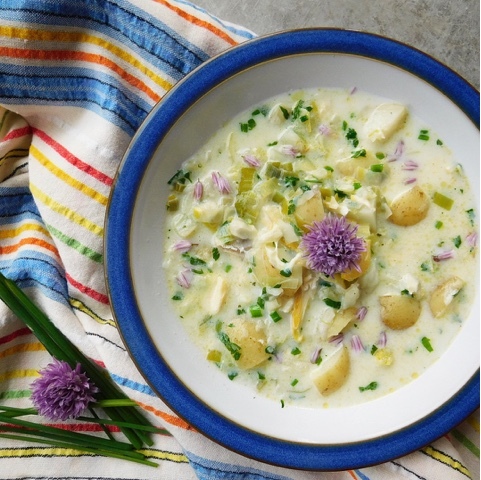 Cullen Skink is one of my favourite soups, your recipe looks so delicious.